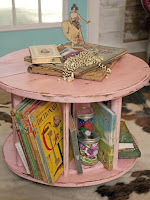 Budget Barbie: Recycling a Wood Cable or Wire Spool into a 'Spool' Table! 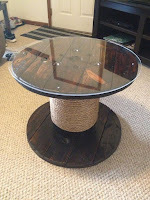 Recycling a Wood Cable or Wire Spool into a 'Spool' Table! Everyone's doing it! I didn't know this when I did it... but as soon as I posted my 'spool table' on my family homepage, my sister-in-law texted me to say she just recycled a spool too! 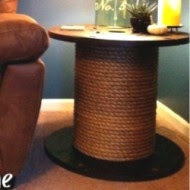 She made hers into an end table and wrapped cording around the center of hers. Mine was going out on the deck and will be in all the elements from rain to snow and 115 degree sunny heat with 100% humidity so although I wanted to leave my table a rough and rustic looking little guy, I opted to put a clear urethane finish on it to help protect it. I am doing two tables. One is a very large, tall table; which is perfect for a cocktail table, for a taller bar stool or for placing plates or drinks if you are standing. I have a second, smaller table that I will be finishing for the patio that is the perfect height for drinks and plates as you sit in your patio chair. The plain cable spool - waiting to see what he can be! Some of these photos have phrases across them because I was sending them to my husband on Snapchat. LOL. It was 100 degrees the day I stained the table and I was HOT HOT HOT. I just wanted to be DONE and go inside and shower. I was SO HOT in 100 degree weather but determined to get the stain on after I was done sanding. Done with the stain! Now I could go shower. Ha ha. The next day I put a clear finish on it since it would be out int he rain, snow, sun, etc. While I love the look of rustic wood, ours will be in high heat, rain and more. I opted for a clear satin finish. It looks very wet and shiny because ... it is! FRESHLY finished and wet. Amazing DIY Wood Pallets Projects BOX SET 3 IN 1: 50+ Outstanding Upcycling Ideas For Your Modern Home!